Look at the fantastic picture above! 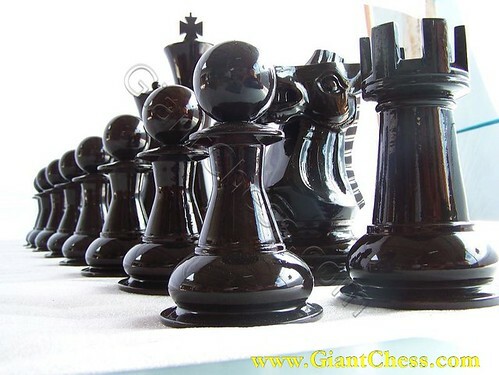 Dark and glossy chess set that made of Teak wood and has perfect polished. It made by professional craftsman and has unique design. Explore the world of this fantastic unique chess sets by get it for your collection. We offers the finest chess sets and chess pieces made of Teak wood along with a very large selection of fine antique sets. Our product is different with other. You can use it for indoors and outdoors game. We are manufacturer of chess set and chess pieces. You will get special prices if shopping here for any use. Buyer usually use those chess set for house decoration also. They often put some chess pieces in their living room or their children room. Because it made of Teak wood, it is very possible for you if you want to having chess game outdoors. You can play chess at your garden, yard, beach, or other in any seasons.